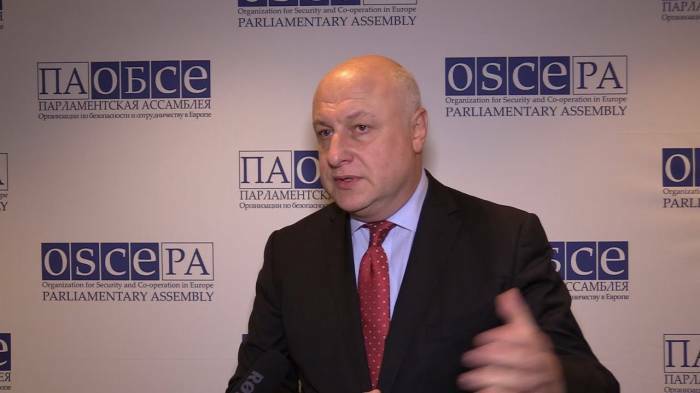 Commitment to OSCE principles and international law have been set aside in the settlement of the Nagorno-Karabakh conflict, OSCE PA President George Tsereteli said during the Third Meeting of Speakers of Eurasian Countries’ Parliaments Oct. 10. President Tsereteli deplored that the persistence of tensions in the Eurasian region maintained significant disparities between countries. "Conflicts are flaring at every corner of Eurasia. The size and scope of Eurasia’s challenges necessitate closer collaboration and constant communication between your countries and our regional and international partners. Unfortunately, what we have seen in recent years within the OSCE has been a deterioration of trust to an alarming extent. Fundamental disagreements have eroded dialogue and entrenched conflicts. Unfulfilled agreements have failed to prevent continued human suffering and, in the end, this has made it more difficult to face our joint challenges and work together in the pursuit of economic success", he said. It should be noted that the conflict between the two South Caucasus countries began in 1988 when Armenia made territorial claims against Azerbaijan. As a result of the ensuing war, in 1992 Armenian armed forces occupied 20 percent of Azerbaijan, including the Nagorno-Karabakh region and seven surrounding districts.